The finishing touches will continue through the month of September on our Hamilton exhibit. Extensive design work has been started on our exhibit 3 (Ottawa), and 4 (Niagara). More detail to come in the following monthly newsletters. 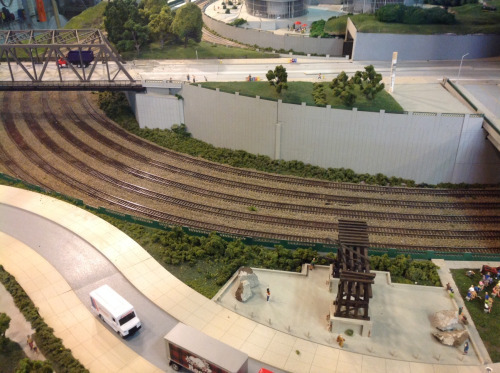 Our Home and Miniature Land has created an original model for the new Rail Deck Park, which was recently announced by Toronto Mayor John Tory. The city of Toronto plans to create an 8.5-hectare (21-acre) park in downtown Toronto. Rail Deck Park, a signature park linking neighbourhoods, will be the biggest section of green space in the city core. Our model is a caricature representation of how we think the park will look, and we built it so we can easily remove it. That way guests can see the railway corridor with or without the park. 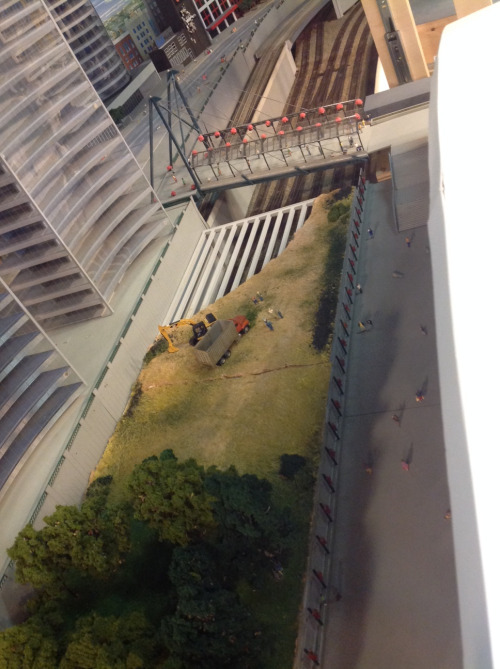 The model has been placed in our Toronto exhibit and is divided into two sections. The first section is a completed park while the second section shows the park during construction so visitors can see how it’s built. The model framework is medium-density fibreboard (MDF,) topped with ‘sculpmold’ (a paper mache product). Subsequent layers are made of coloured ground foam with an application of static grass to provide additional texture. The model was built by scenery specialist Dan Notley and Adam Wood, an architecture Co-op student from Laurentian University who spent the summer with Our Home and Miniature Land. The City of Toronto plans to hold a design competition for the new park, and we may submit our own plans. Jean-Louis Brenninkmeijer did an interview about Our Home and Miniature Land in French for TFO, the French-language side of TVOntario. The interview was posted last month. TFO serves two million students and 30,000 teachers across Ontario and the rest of Canada, and operates the number one French-language Youtube Channel in the country. So this is very much of great interest to us. Reporter Chrystelle Maechler and her camera man pose for a photo outside our offices on the day of their visit. Like many people, Adam Wood was “blown away” the first time he saw Our Home and Miniature Land. Seeing the exhibits in a video is one thing, but actually being there and witnessing the place is something else again. He wound up staying the entire summer. Adam, 19, has just started his second year of study at Laurentian University’s McEwen School of Architecture in Sudbury, and he spent this past summer as one of two OHML co-op student employees. His responsibilities included designing structures for the exhibits on AutoCAD, making cut-out shapes on the lasercutter, and assisting with final assembly after items were painted and weathered. He worked closely with David Domanski who studied architecture at the University of Waterloo, and his brother Mark who is a civil engineer. Adam, a native of Oakville, enjoys such hobbies as graphic design, photography and hiking. His favourite book is Ender’s Game and his favourite movie is Boyhood. The Grand Trunk Railway opened its broad-gauge line between Toronto and Montreal in October, 1856. The railway, initially incorporated in 1852 as the Grand Trunk Railway Company of Canada with the express purpose of connecting the two cities, is historically significant. In fact, it was one of the factors in the creation of Canada. The outbreak of the Civil War in the United States was more than a passing concern to colonists in the United Province of Canada; there had been attacks from the Americans many years earlier in the War of 1812, not to mention the Fenian raids which began in 1866. Thus, a railway was a strategic commodity because it represented the only way to bring in British reinforcements in winter when the St. Lawrence River would freeze. As things turned out, the BNA Act of 1867 provided for an Intercolonial Railway to link up with the Grand Trunk, which by that time was the largest railway system in the world.